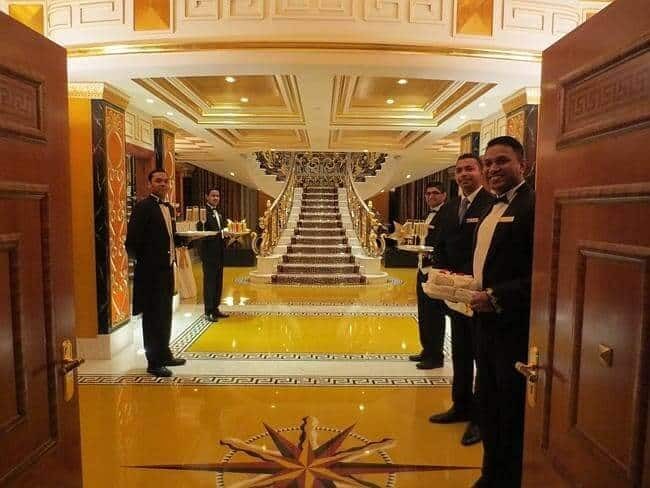 In this post, I have shared amazing information about Burj Al Arab hotel which is one of the most luxurious and expensive hotel in the world managed by the Jumeirah Group. The hotel never fails to impress its guest as it provides a jaw-dropping view of the city and the Arabian Gulf. You must have seen a lot of pictures of the hotel on social media, blogs, and travel website. But, have you seen the inside pictures of the hotel? I am going to share information about the luxurious hotel in detail. According to the list released by MasterCard’s Global Destination Cities Index in the year 2018, Dubai ranks 4th on the list of most visited cities in the world as around 16 million people visited Dubai in the year 2017. Now from the number of visitors who visited Dubai to spend their holidays, you can imagine how much love the city receives from the tourist and it won’t be wrong to say that it is one of the hottest destinations in the world for travellers. Even after so much of the craze and love for Dubai, very few can manage to book a stay in the Burj Al Arab hotel. The reason is simple it is one of the most luxurious and expensive hotels in the world. Let’s find out more about the hotel such as rooms and suites, lobby, view it offers, architect, beach, restaurants, etc. The hotel has 202 bedroom suites whereas the smallest suite has an area of 169 m2 (1,820 sq ft) and the largest is 780 m2 (8,400 sq ft). In spite of the 56 stories, the hotel contains only 28 double-story floors which mean each room is a duplex suite. Apart from this, all suites offer breathtaking views of the Arabian Gulf which is a treat to eyes. 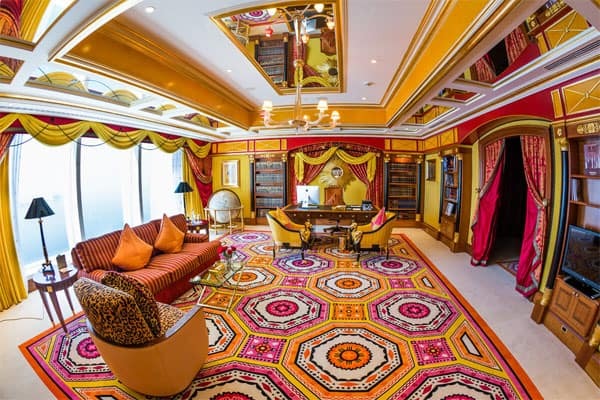 This is one of the most famous and expensive room in the world. You must have read a lot about the royal suite in magazines, news websites, and travel blogs that how expensive and lavish the suite is. 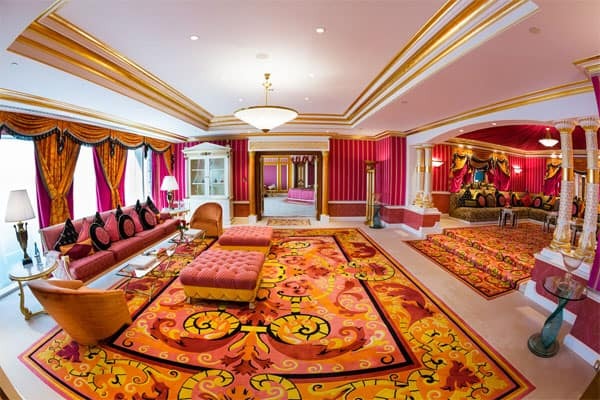 Do you know how much you need to pay to stay in the royal two-bedroom suite? A whopping amount of AED 85,000 (INR 1,651,655.46) excluding tax & fees. Yes, you read it right, it’s more than $23,000 for one night stay. Still can’t believe the suite price? You can check it by yourself by visiting the official website of the hotel –Burj Al Arab Jumeirah. However, you can book the same room at the best price of AED 40,000 (INR 777,249.63*/ $11,000) during off-season in Dubai. Check out for offers on Burj Al Arab hotel at Booking.com. Unfortunately, even this is too costly for the lots of visitors who come to Dubai to spend their vacation. If, you ever dream to live like a king than this is the right place for you. The kind of luxury this hotel can provide no other hotel can offer you the same. Be it design, architect, top-notch service, lavish suites, amenities, or anything. Upon your arrival, you are served with a complimentary bottle of wine or grape juice by a personal butler who is available for 24-hours. You also get AED 4000 resort credits once per stay and a 21-inch gold-plated iPad during your stay. 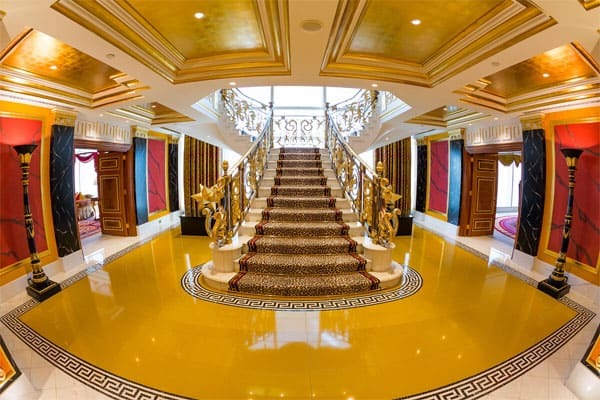 This is the entry hall of the royal suite which is covered with gold and marble all over. It also consists of a grand and beautiful staircase leading to the suite’s upper level. You also get access to the private elevator in-case you decide not to use a staircase to go to the upper level of the suite. The size of the royal room suite is 780 square meters which consists of the 2 master bedrooms with two king side beds for 4 adults and two children, 2 spacious dressing room, separate dining room for 12 person, exquisite majlis style lounge, library and cinema room. The two master bedroom are covered by Egyptian cotton linen and an ultra-deluxe twin bed personalised to suit your specific posture preferences with option to choose from 17 types of pillow. For now, we have just seen the entrance hall and bedroom; let me now take you through other parts of the suite. 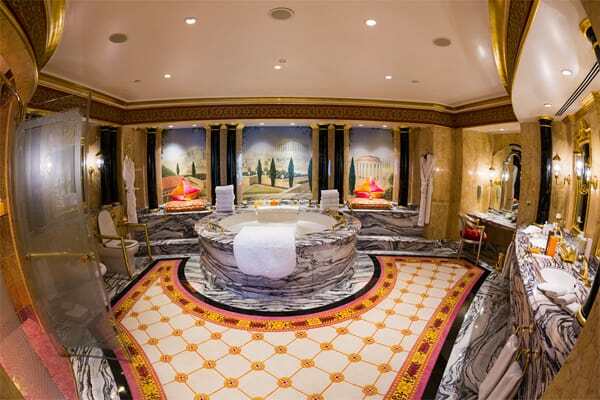 Have you ever seen a bathroom like this in any hotel of the world? No, right. 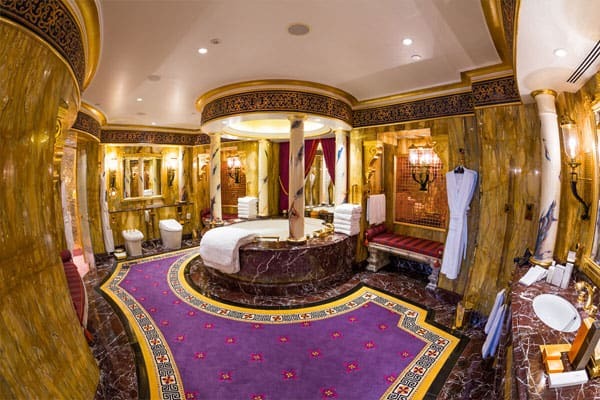 The suite consists of 2 master bathrooms which is decorated with gold and marble. It also consists of a full-size Jacuzzi and a separate five-head rain shower, a set of his and hers full-size Hermes products, and more. In the photo, you can see cushions placed around the seats along the edge of the bathroom for the guest. They have kept this for the guest in-case they feel like chilling out there. Look at this spacious living room which has classic sofas and beautiful carpet which will make any guest feel like they are in a royal palace. After seeing all this, you must be thinking that this hotel is like Aladdin’s Genie you wish for anything and you get it. Did I mention the private library? Here is it how it looks. If, you love reading you would surely enjoy your time by spending some time here. 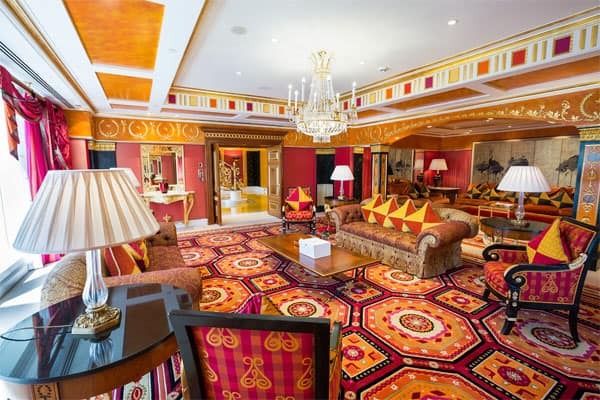 The presidential two-bedroom suite is also two-storeyed room built over a 667 square meters. Even, in this suite you get almost same amenities, services, and facilities which is offered for the royal two-bedroom suite guest with few differences. However, in-terms of luxury, style, and looks there is no comparison with the royal suite. This room is equipped with two bedrooms, two separate dressing rooms, two private bars and lounges. 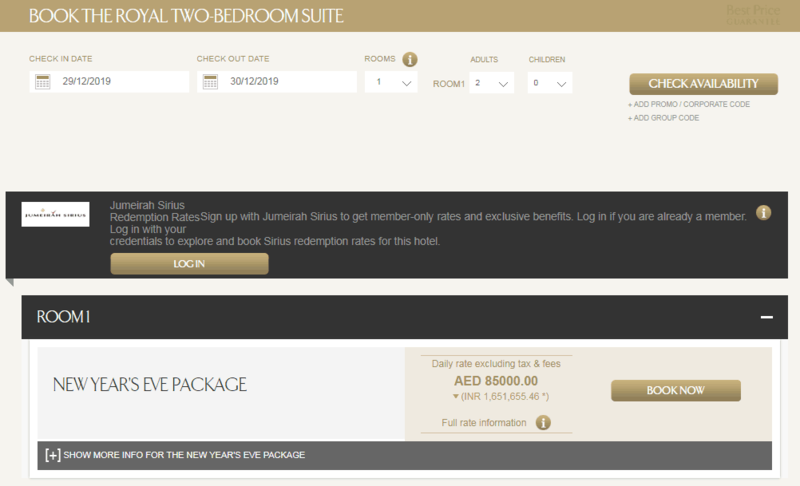 Like royal suite, here you get AED 3000 resort credit once per stay. The size of the diplomatic three bedroom suite is 670 square meters with this you get complimentary airport transfers in Rolls Royce Phantom and AED 2000 resort credit once per stay. The room consists of a two king bedrooms and a twin bedroom for 6 adults and two children. You can get all types of services from luxurious to basic such as wardrobe packing, unpacking, shoe shine, etc. At the time of booking this suite you also get complimentary airport transfers in Rolls Royce Phantom. The interior of the hotel is designed by Khuan Chew, of KCA International. 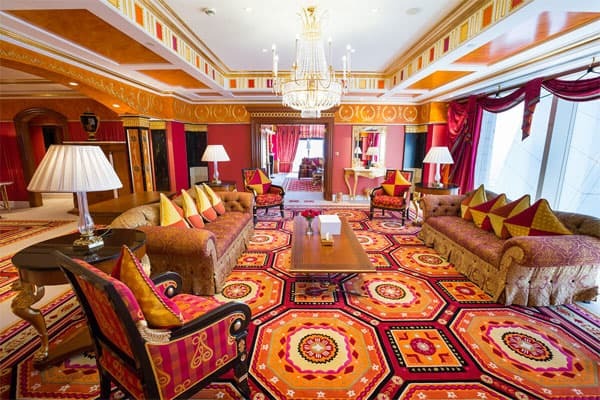 A theme of traditional Arabic hospitality was infused with earth tones and fine materials from all over the world, including chandeliers, carpets and 30 types of marble. The interior of the hotel features an atrium with a central fountain and a cascading waterfall with columns embellished with 24-karat gold leaf. The moment you enter the hotel you will be stunned by seeing the interior design of the main lobby which consists of gold pillars, dancing fountains, and aquariums. Tip: If you ever plan to visit this luxurious hotel for an afternoon tea make sure that you visit before time so that you have a lot of time to take enough photos of the lobby and atrium. The atrium in the hotel is 180 m high, it’s the highest atrium in the world, the atrium is formed by the Teflon coated fiberglass cloth enclosing the two “wings of the sail” of the building. The Burj Al Arab hotel was designed by WS Atkins led by architect Tom Wright. This project was a challenge to WS Atkins engineer team as they were building the hotel on the sand, which is unusual as tallest buildings are founded on a rock. This project was a challenge to WS Atkins engineer team as they were building the hotel on the sand, which is unusual as tallest buildings are founded on a rock. It took three years to reclaim the land from the Arabian Gulf, whereas it took less than three years to build the magnificent hotel. However, 70,000 cubic meters of concrete and 9,000 tons of steel were used in the construction of the hotel. The Burj Al Arab is 14 meters taller than the Eiffel Tower. 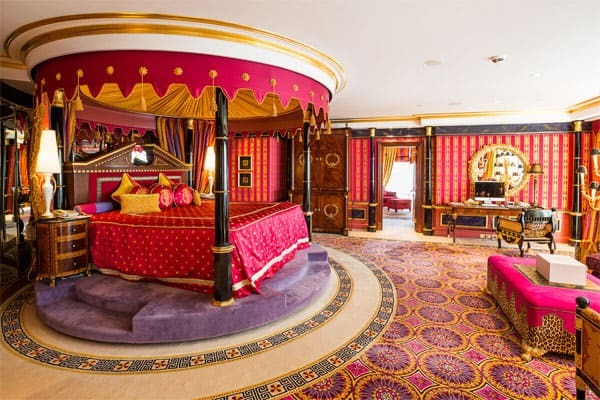 The Eiderdown comforters used at the Burj Al Arab are rarest in the world. There are 17 different types of pillow available for guest. The hotel is built on the man-made island. It took 5 years to build the hotel. Pools are decorated with 10 million gold and azure mosaic tiles. 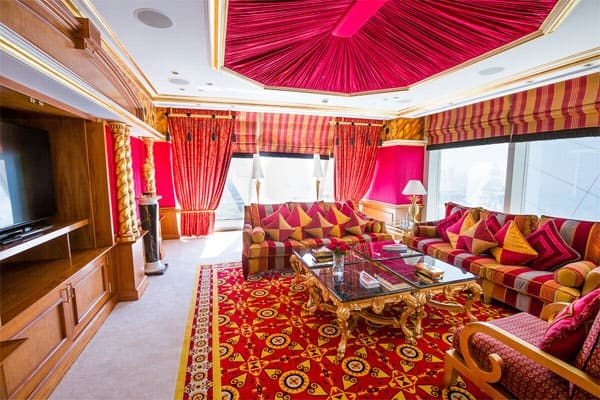 1,790 square meters of 24-carat gold leaf is used to embellish the interiors. 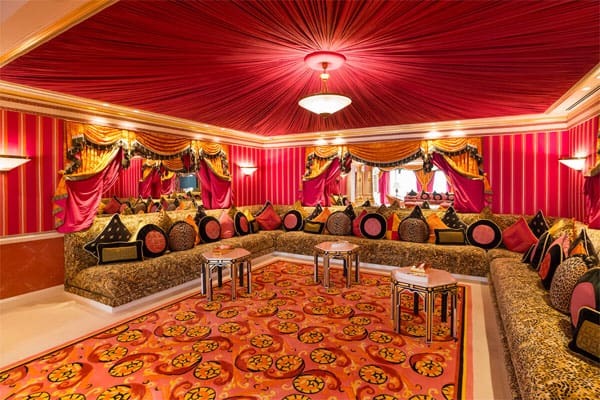 The Junsui restaurant has the largest Swarovski crystal ceiling which is worth Dhs1.3 million in total. The hotel offers Hermes amenities in every suite for its guests. The hotel has a man-made terrace of size 10, 000 square meter which was shipped from Finland. Whether you are planning to visit the Burj Al Arab hotel for a stay or afternoon tea. Make sure that you make the booking in advance to save big. I hope that you liked this blog post on one of the most luxurious hotel in the world.